SOUTH BRONX — From Olympic-style tracks to a path along the Harlem River, the South Bronx offers its residents no shortage of places to go running. Two spots that the Parks Department recommends are Macombs Dam and Mill Pond Parks, both located right by Yankee Stadium. Fitness buffs at Macombs Dam Park can run around a 400-meter track made out of the same rubberized surface that is used by Olympic athletes, while those at Mill Pond can traverse a roughly half-mile path that snakes alongside the Harlem River, according to the Parks Department. Michael Linton, a 38-year-old actor and model, said he comes to Macombs Dam Park to run four miles almost every day and loves it, given that the runners are polite, the surface of the track is easy on his running shoes, and the view is tough to beat. "It's a great facility," he said, "and it's not bad looking at Yankee Stadium while you run." Chef Carl Peter, 55, felt the same way about Mill Pond Park, where he said he goes to jog every day. "It's peaceful. It's clean," he said. "There's a lot of beauty to the place. That's what I like about it." Bronxites looking to travel a little farther east for their workout can go to Soundview Park, which just got a new $6 million track and field center last summer. 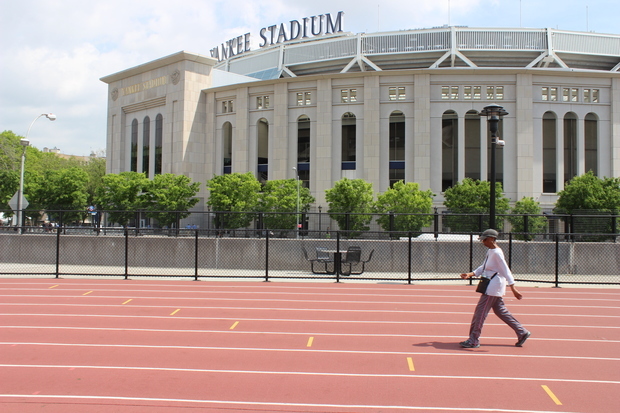 Alternatively, head down to Mott Haven and use the track in the fitness center at St. Mary's Park. The Parks Department is working to set up some marked running trails in St. Mary's Park and Crotona Park, according to Scoones. The loop in Crotona will likely be about a quarter mile long and will go around the park's lake, while the loop in St. Mary's should be about a third of a mile long and follow the paths that run through the park. "These are not long distance running, but they are a little more challenging, especially in St. Mary’s," Scoones said. "There are some relatively good grades to go up and down there." Crotona Park is also home to the Crotona Park Running Club, which Bronx resident Abiodun Bello established last year. The group meets at 8 a.m. every Saturday and Sunday in the park at the intersection of Crotona Avenue and Claremont Parkway. Bello described Crotona as an ideal park for runners due to its lake and "beautiful trees." He said about 10 people generally show up for the running club. "It’s a nice place to run. I love Crotona Park," he said. "I wish more people could come out and run." Did we miss your favorite running spot? Let us know in the comments.